revOnline is our user contributions area, accessed from within LiveCode as well as online. You can upload and download stacks here to share with the user community. To do so you must have a valid LiveCode license. Here is how you can log in, from the LiveCode interface. Start up LiveCode from your Applications folder (on a Mac) or your Programs (on a PC). 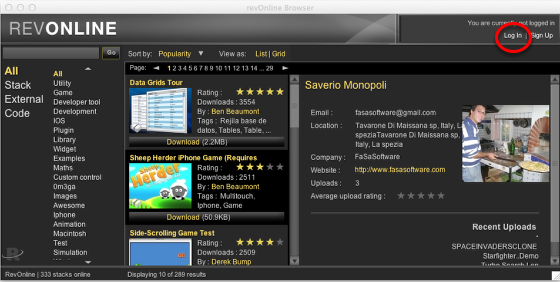 Click on Development/Rev Online, and the revOnline browser will open inside LiveCode. In the top right corner, click on the small "Log in" link (circled). Enter the email address you signed up for revOnline, and the password you received specifically for revOnline. These are not the same as your LiveCode account details. 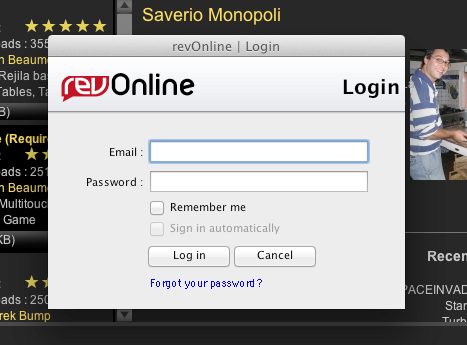 If you have not yet signed up for revOnline, you can do so by clicking on the "sign up" link next to the "log in" link. If you can't remember your password, or you get it wrong, you will see some blue text appear below the login buttons, "incorrect log in, forgot password?". Click on this to have a new password emailed to the address you entered in the email box. 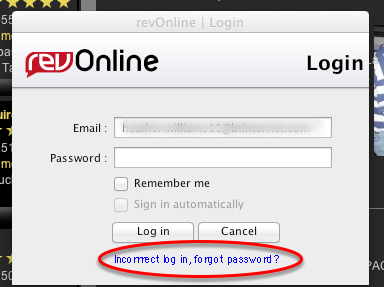 Note that if you do not have a revOnline account under that email address, your new password will never arrive.